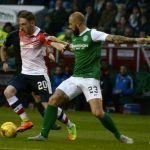 A last-minute strike from James Keatings sunk Raith at Easter Road despite a stirring second-half performance from the visitors. 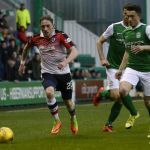 Second-half goals from Declan McManus and Ryan Hardie twice pulled Raith back into a contest which had threatened to escape during a one-sided first half, only for Hibs to steal all three points with an injury-time winner. 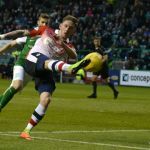 Although Raith’s barren away run continues following another defeat, Rovers tested the League Champions to the limit, creating chance after chance in a second half full of hunger, endeavour, and spirit. 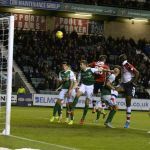 Rovers’ players fell to their knees at the full-time whistle, robbed of a deserved point with the last kick of the game. 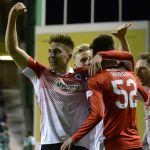 With Raith Manager John Hughes stating pre-match his target to preserve Raith’s Championship status was a further four points, appropriately he made four changes from the impressive 2-0 win over promotion-chasing Morton. Yet, despite having freshened his starting XI and the whole squad benefitting from a free weekend, it was the hosts who were far stronger in the opening stages. 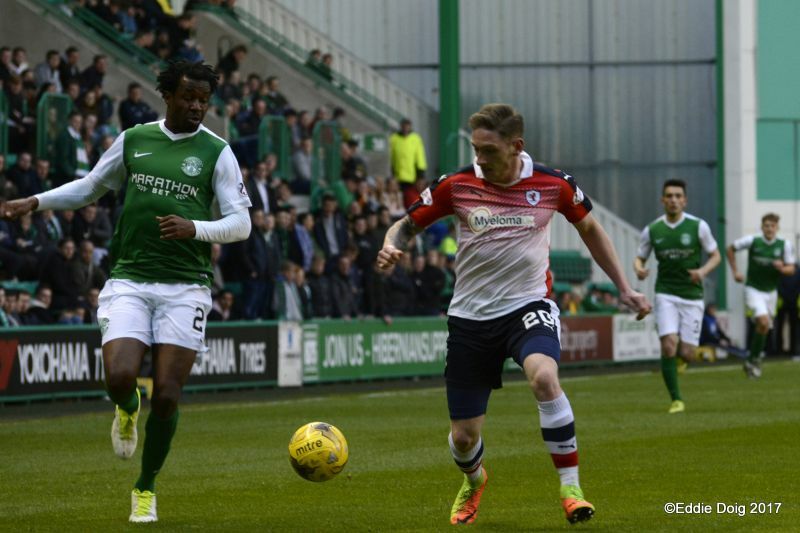 Neil Lennon was true to his early week predictions, fielding a much-changed side. 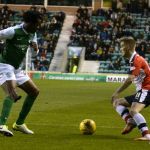 Four academy graduates started, and of those who started in Saturday’s traumatic Scottish Cup semi-final, only Efe Ambrose retained his place. 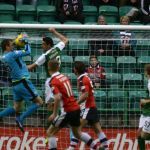 Of the few senior players to hear the referee’s first whistle, James Keatings and Brian Graham no doubt relished their starting roles. 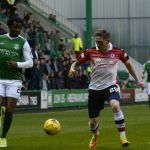 Of the Raith changes, Declan McManus was the first to shine – his early strike beyond Laidlaw’s post showing early intent. 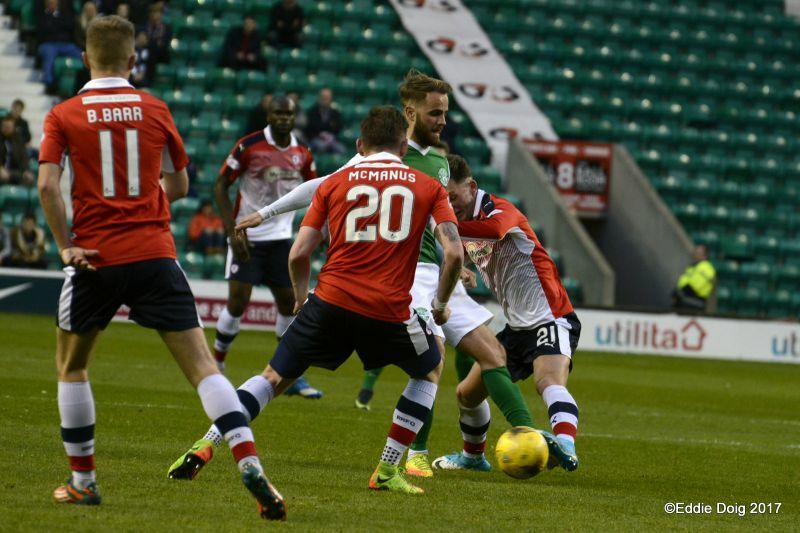 Some nervous touches in the home defence encouraged McManus and Mark Stewart to chase and harry. 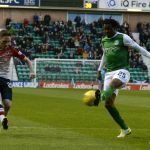 Despite a number of misplaced passes, on the break Hibs were dangerous. 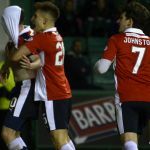 Chris Johnston and Jordan Thompson couldn’t settle, and both Keatings and Graham tested the Raith defence with firm headers in the opening five minutes. 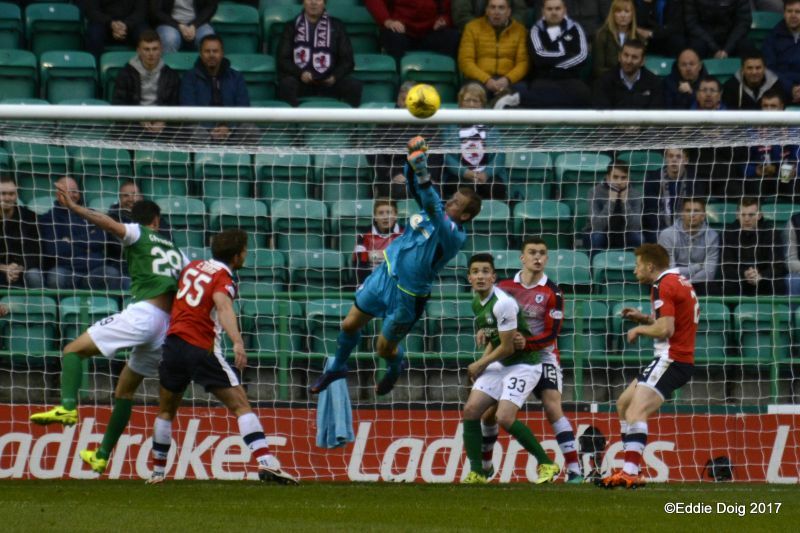 Penksa’s save from Graham drew deserved applause. 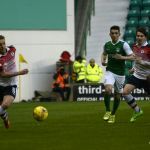 With Matthews and Barr also slow to get to match pace, Hibs’ young midfield grew in confidence. 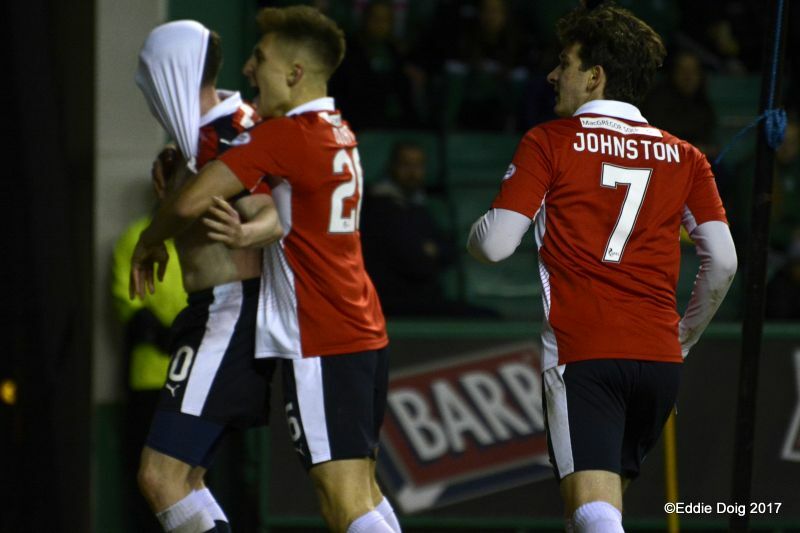 By the quarter-hour, Hibs were in control. 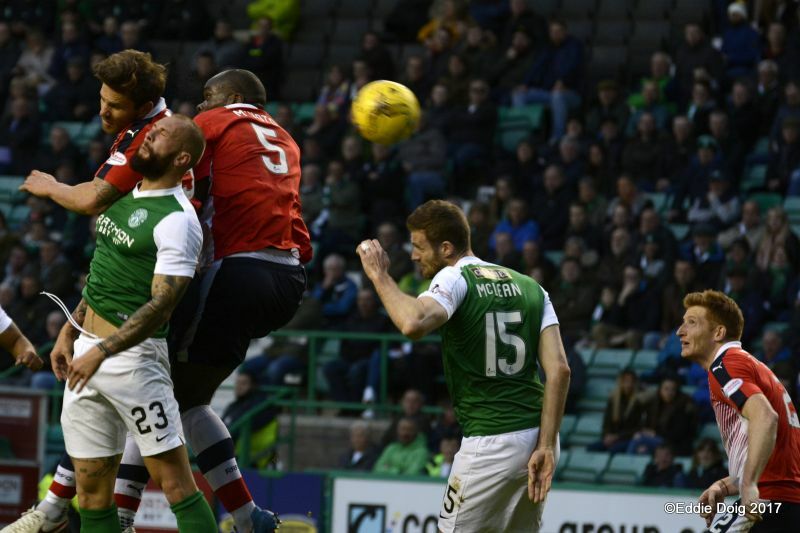 Crosses whizzed toward the Raith box, Fraser Murray swept passes left and right with an authority beyond his years, and winger Chris Humphrey devoured space down Hibs’ right. 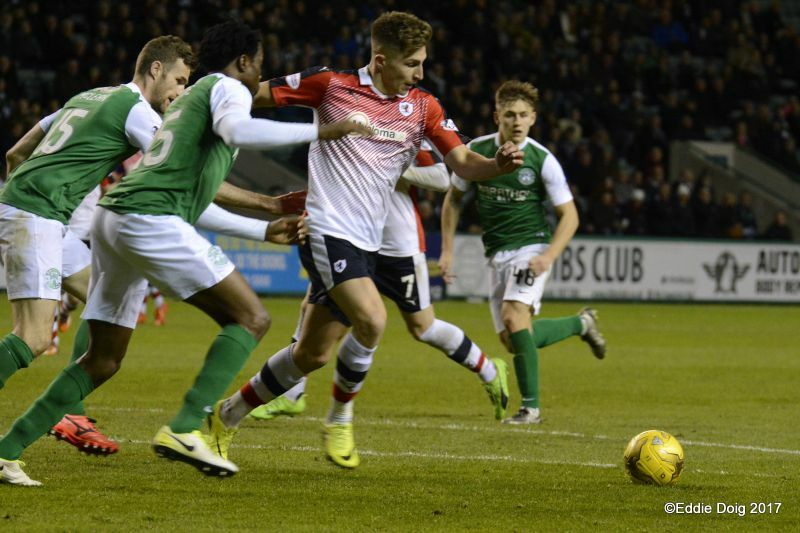 Despite their relative youth, there was a well-oiled look to the hosts as Raith struggled to retain possession. 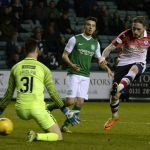 Shinnie and Murray both found space, troubling Penksa from distance, and Graham Harris and Martin all looked lively in front of a jumpy Raith rearguard. Penksa fumbled a Humphrey cross, Thompson clearing the danger. 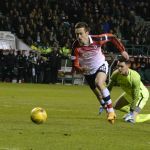 Brief respite for Raith with twenty-five minutes gone – Keatings was booked for a push on Stewart with a counter-attack on. 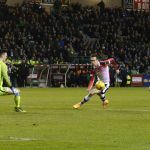 Within a minute, McManus cleverly found Barr who’s touch inside allowed Johnston to set himself – the former Kilmarnock winger fired in a powerful low shot, well gathered by Laidlaw. 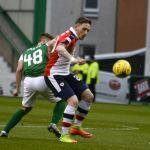 With half-an-hour gone, it was clear the momentum of the opening phase had dissipated – Raith’s midfield, anaemic early on, began to impose themselves. 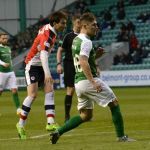 Johnston wriggled and squirmed, drawing several fouls; McManus held play up well; Thompson and Matthews upset Hibs’ rhythm, forcing several wild passes and forced clearances. 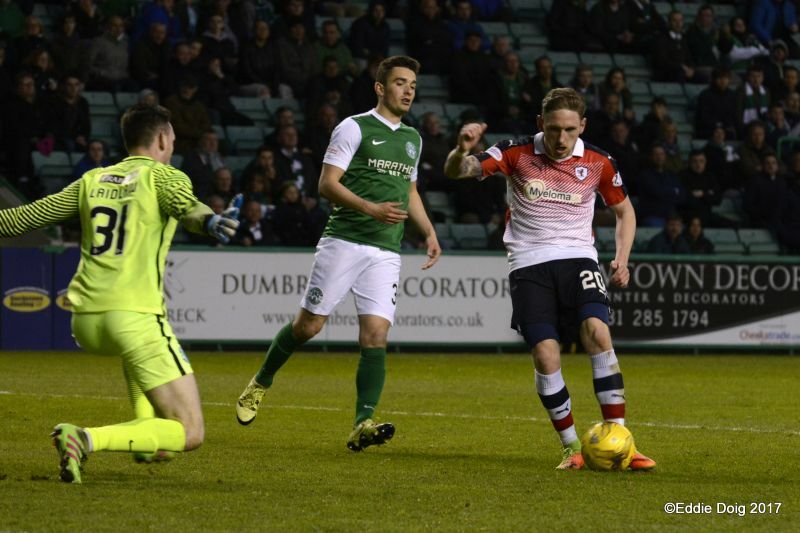 With Raith’s first corner, McManus fizzed a shot narrowly across goal from Thomson’s flick. 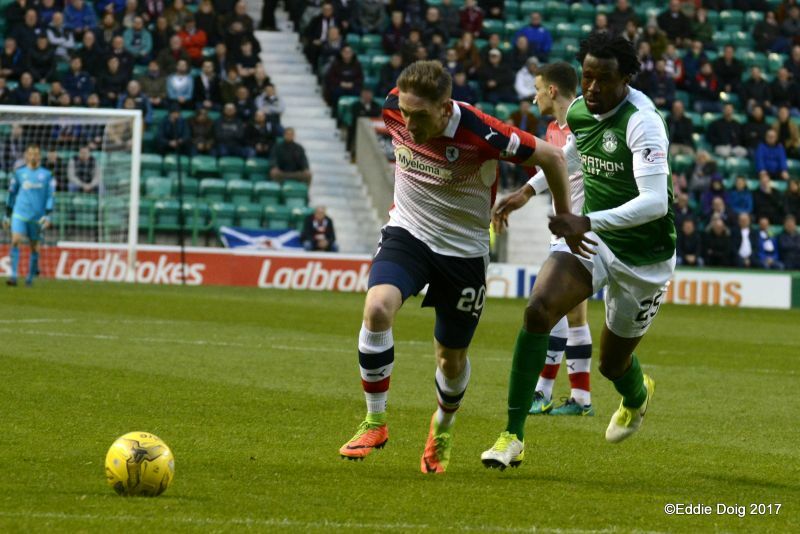 Just as Raith thoughts may have drifted toward the interval, a classic counter-attack. 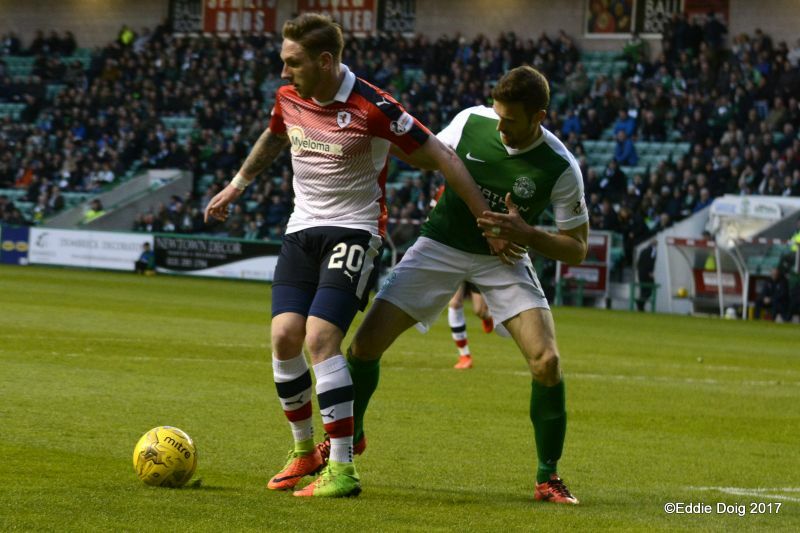 With Raith playing a high line, Humphrey was released into acres of space behind McHattie. 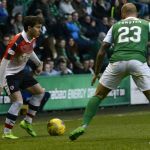 With time to cross, the young winger proffered an invitation Keatings couldn’t refuse, the striker planting his header beyond Penksa. The striker nearly had a second moments later, a curling drive drifting just wide. 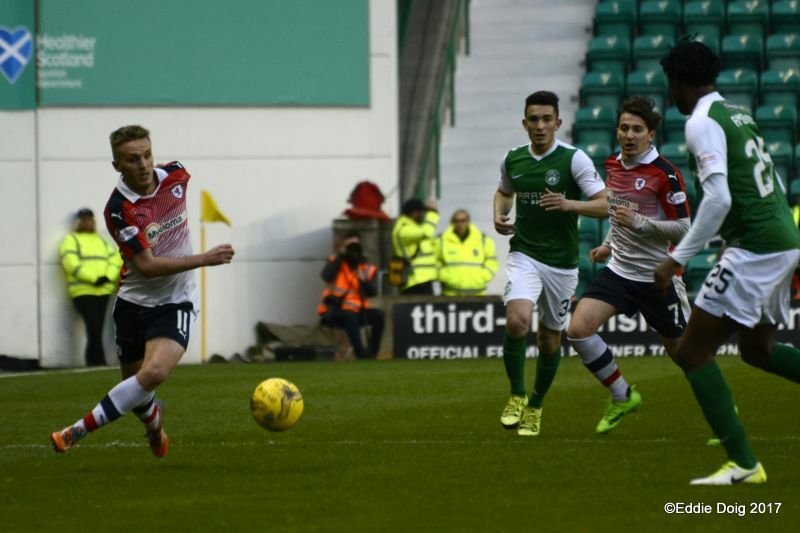 Albeit with different agendas, both sides opened the second half on front foot. 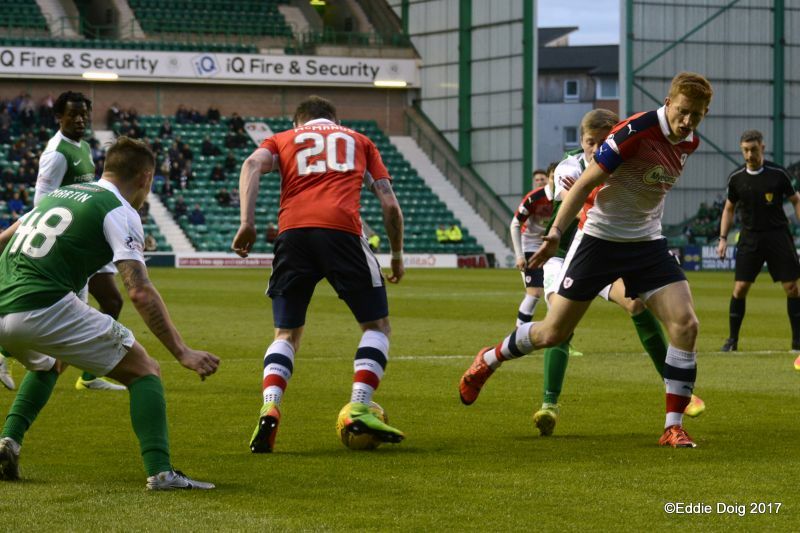 Raith, scrapping at the foot of the table, snapped into tackles from the off. 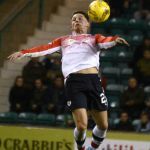 Under pressure from McManus and Stewart, the youngster Harris cleared awkwardly over his own bar. 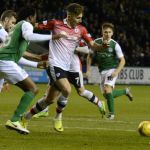 Sleeves rolled up, Raith looked to forget their first half and match their opponents one-on-one as the second period began at a much higher tempo. The hosts, with numerous players vying for attention, slipped through the gears at every opportunity. Fraser Murray bundled a shot wide after releasing Alex Harris to cross. 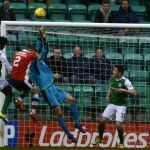 Graham played Humphrey into space, with only Jason Thomson’s last-ditch header saving a certain goal as Keatings arrived at pace. Those late to their seats after half-time missed a step-change in quality, tempo, and application from both sides – the second half crackled as both sides flew into the action. 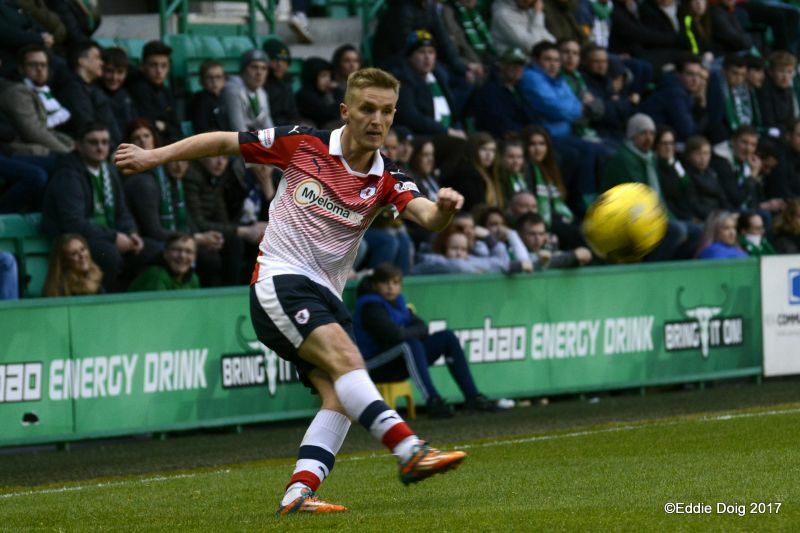 Howls of protest from the visiting fans on fifty-four minutes – McHattie’s excellent through-ball set McManus free. 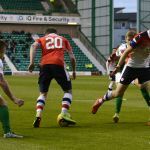 With Harris chasing, McManus won his challenge and fired beyond Laidlaw, only for a referee’s whistle to stop play – the Raith striker’s nudge on the covering defender deemed more than a shoulder-charge. 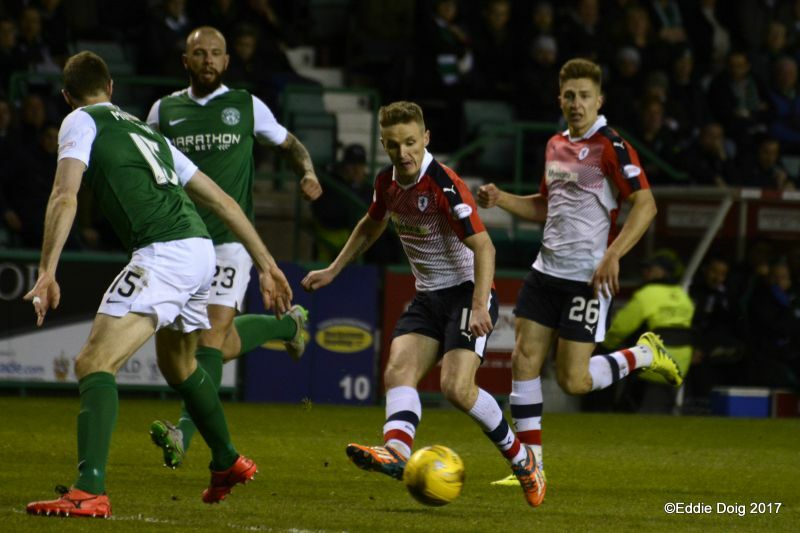 The disallowed goal spurred Raith to greater efforts. With Jonny Court on for Mark Stewart, Bobby Barr thumped a drive into Ambrose’s midriff, Thompson blasting the rebound over. 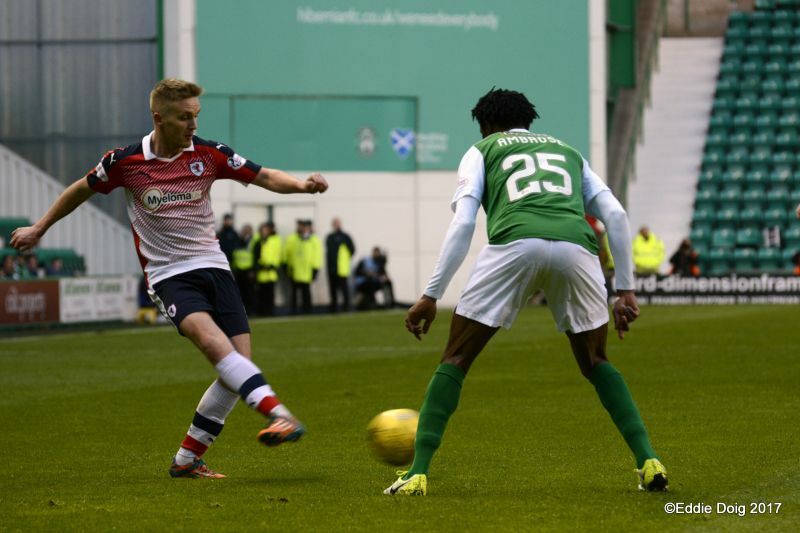 Defensively, Hibs were creaking. 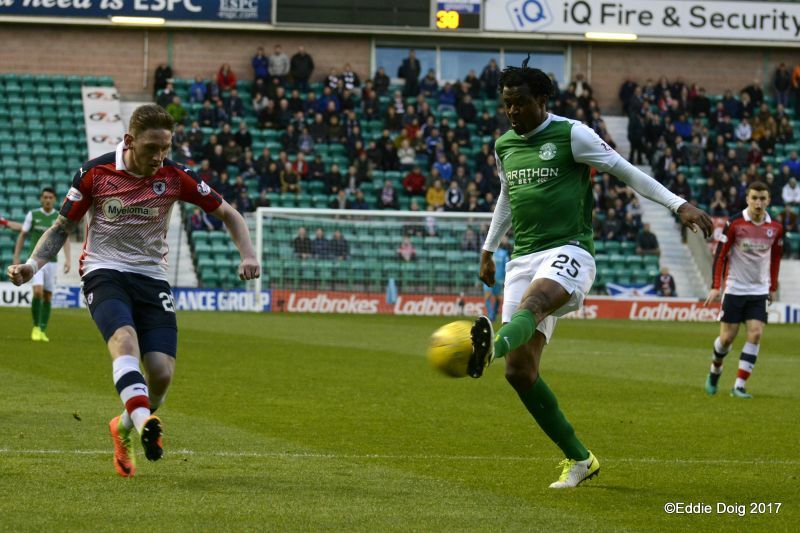 With Raith generating more pressure, and Hibs struggling to clear, an equaliser began to look more likely. 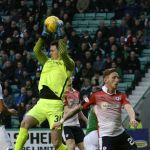 Johnston had robbed Martin, narrowly missing Court with his through-ball, before Craig Barr appeared in an advanced position, turning his man to shoot goalwards. 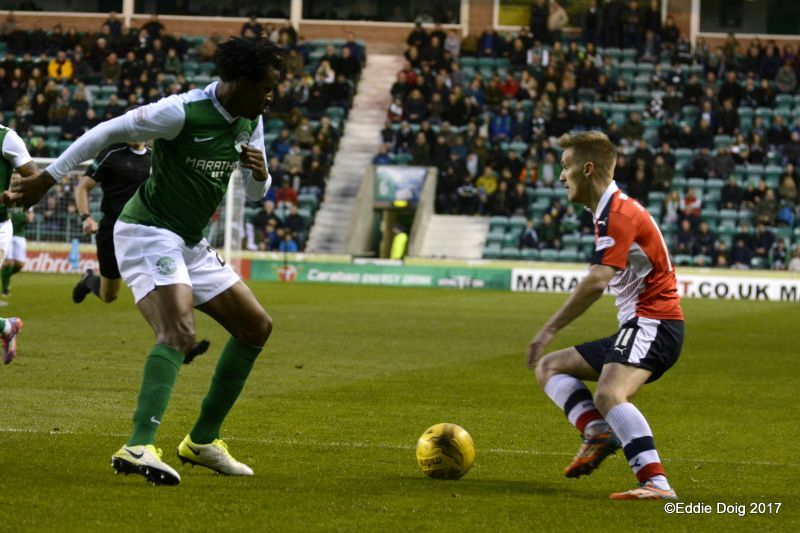 Hibs’ defence was at action stations. On sixty-six minutes, a deserved equaliser. 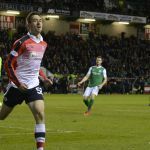 Another slack clearance allowed Barr to run at Forster – drawing his man, the Raith winger played in McManus who fired coolly beyond Laidlaw. 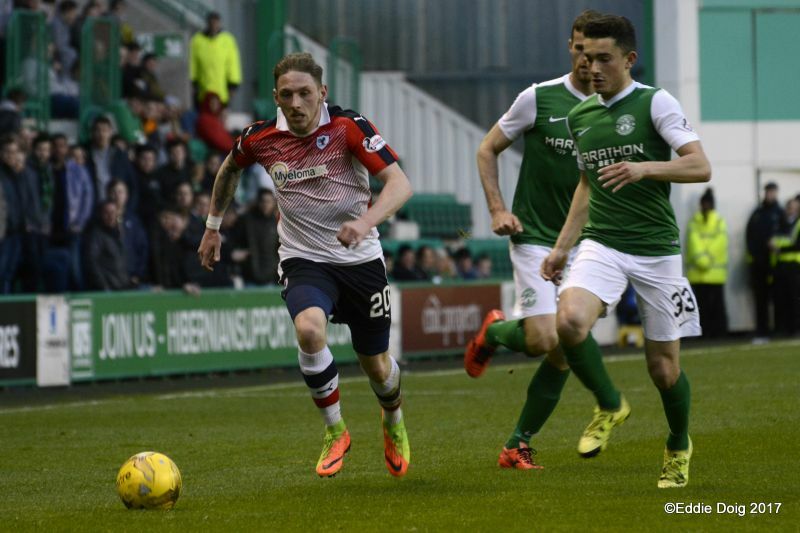 Still Raith pressed on. 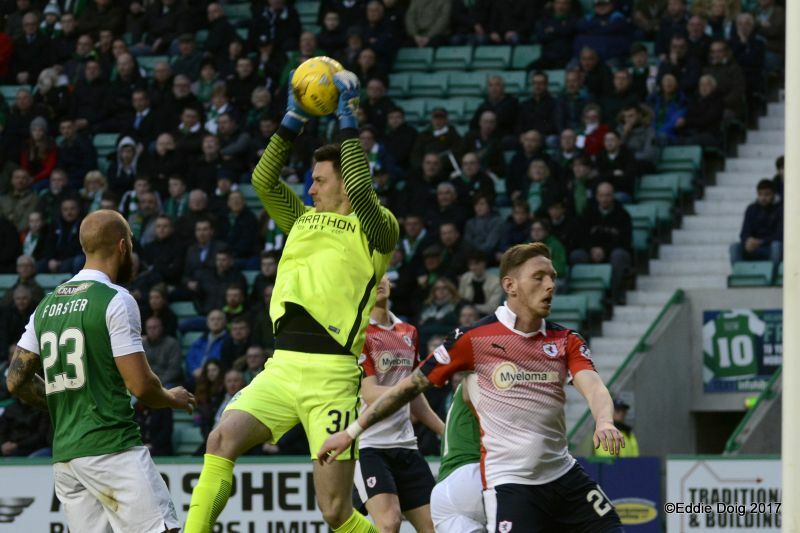 With the home support growing restless, Ambrose mis-judged a high ball – McManus turned from a wide position, and – looking up – clipped his shot against the inside of Laidlaw’s post. 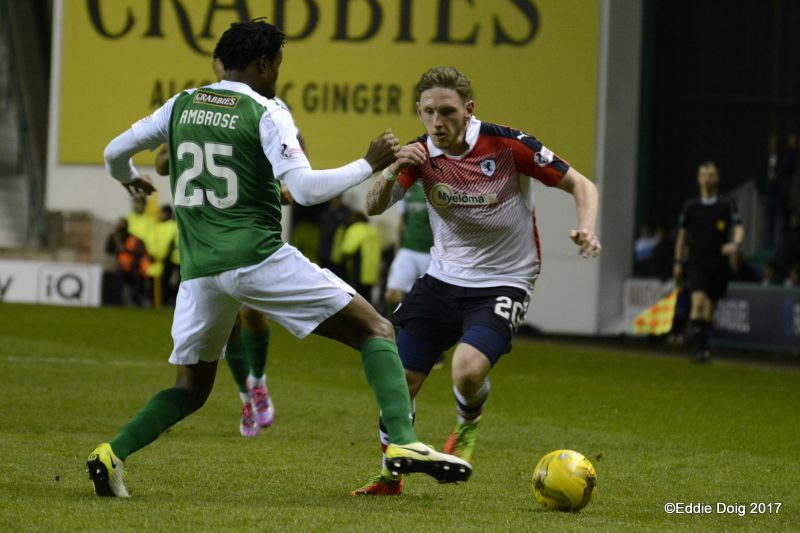 Running at Ambrose again, the Raith striker drew a booking from the Hibs defender with another surge moments later. Watching from the directors’ box, manager Niall Lennon sought to steady the ship. 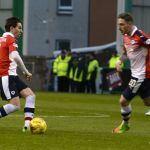 Bartley and Holt were introduced to restore order, although Raith’s pressure continued. 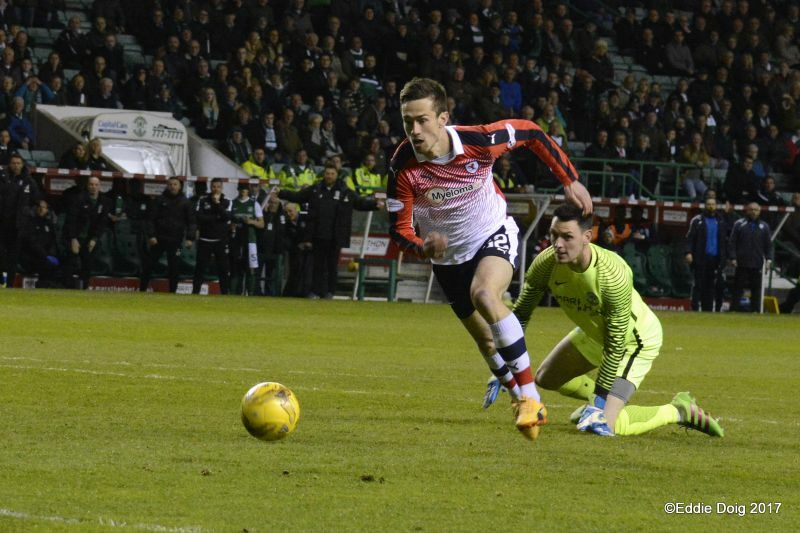 McManus’ spectacular overhead kick required a top-drawer save from Laidlaw to maintain parity. M’Voto was next, heading wide from Johnston’s centre. 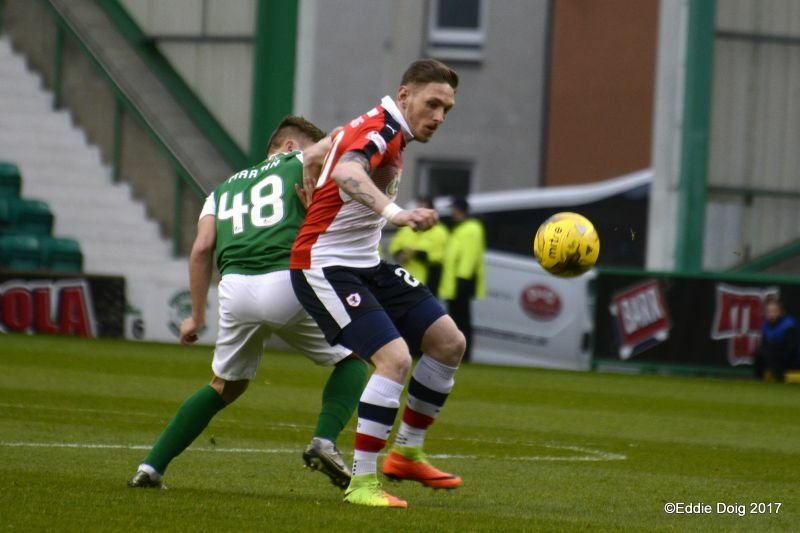 With ten minutes to go, Raith’s aggression and pressure were undone by a single lapse. Court had clattered Bartley with an untidy challenge moments earlier, and with tempers fraying in midfield, a long diagonal escaped both M’Voto and Barr, Grant Holt nipping in to prod beyond Penksa. Despair for the visitors, and relief for a home support who had seen their team second-best for long spells in the second half. 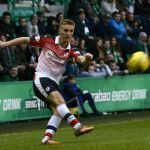 With a spirit absent from the first half of this season’s campaign, Raith regrouped, recharged, and attacked again. 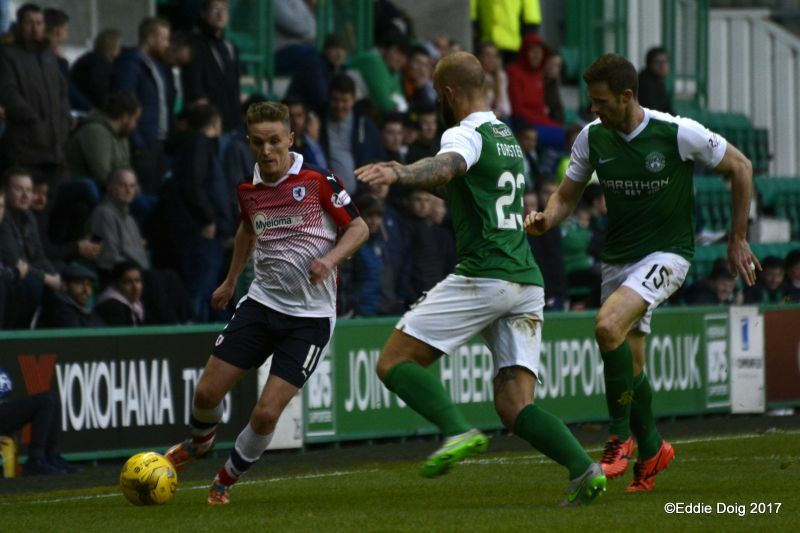 McManus barrelled into Forster, Barr charged through midfield, and both Thomson and McHattie sought to break up both flanks. 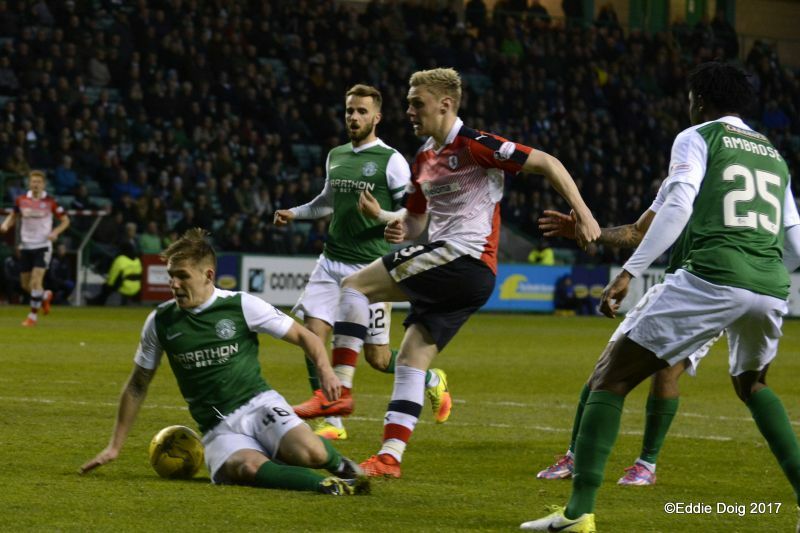 With the clock ticking down and Hibs’ defence arguably too high, a quick Raith break left Forster exposed. 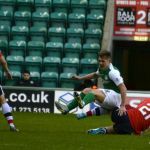 The defender clattered Court on half-way but the youngster’s through-ball found Hardie on his own. With referee Aitken playing an excellent advantage, Hardie rounded Laidlaw and shot home – cue delirium in the away support. 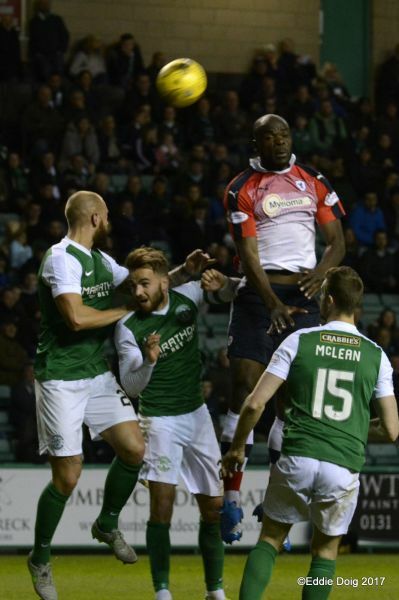 With the ninety minutes up and the match in injury time, both sides looked as likely as the other to take the points. 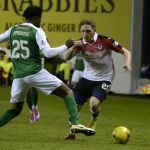 With Raith’s last foray, Thomson and Hardie attacked down Hibs’ right, losing out to a Forster challenge. 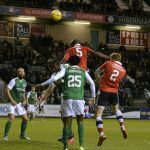 Hibs’ last roll of the dice saw Bartley feed Humphrey who squared into a mêlée – inexplicably, Jordan Thompson raised his arm to clear the cross. 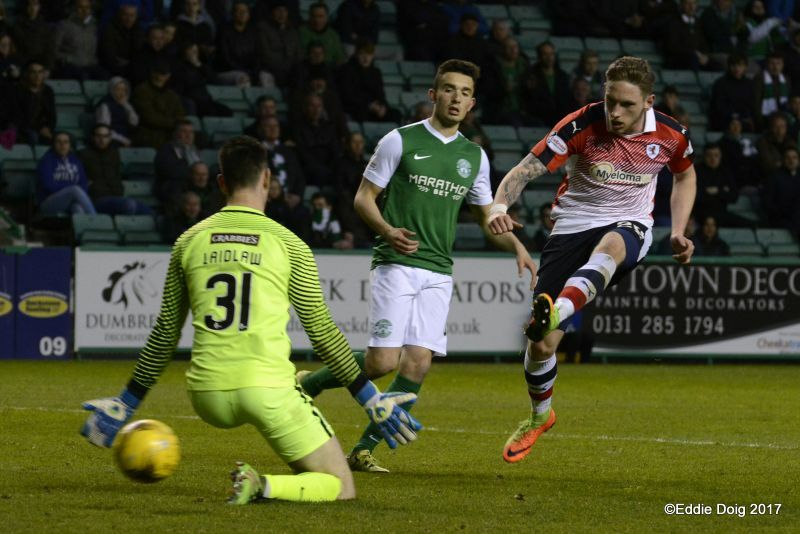 With a burst of joy from the home support that was heart-breaking for visiting fans, Keatings walloped the free-kick past Penksa. 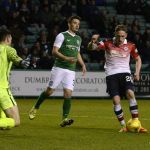 As the Raith fans drifted off into the cold of the night, and a Proclaimers’ victory anthem boomed across the home terraces, attentions turned to an ever-more critical trip to Paisley on Saturday. The visitors showed heart and no little endeavour in a tremendous second-half showing, but would take nothing but courage and pride from another away defeat. For manager Hughes, the job of lifting the players again for the next assault; for the players, the job of taking tonight’s second half and beginning as positively on Saturday. Welcome to Easter Road for the last time this season, it's 9 degrees and the air is still. 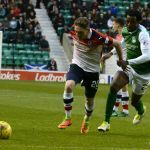 Hibs kick off towards the Raith support. McManus shoots wide from 20 yards. Humphrey flicks in a cross and Fraser Murray heads just past the post. Humphrey this time to Graham who forces Penksa to tip the ball over the bar. 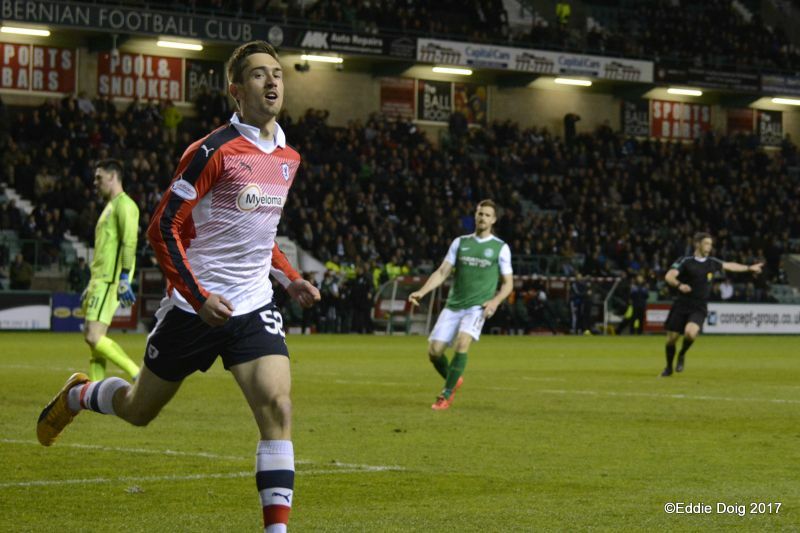 Shinnie bursting into the box, Thompson clears. Humphrey crosses, Penksa spills and Thompson clears. Matthews and Thompson getting treatment after a collision. Humphrey and Graham combined the latter heading wide of goal. 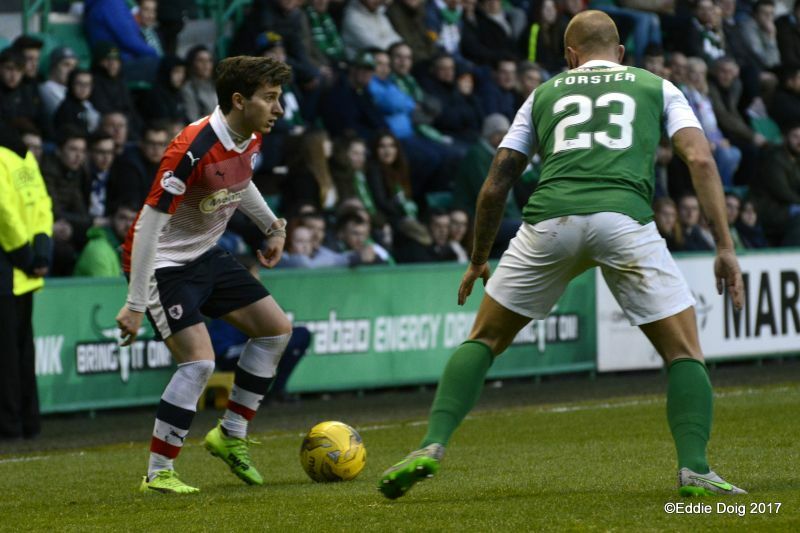 Forster stumbled in the box and Laidlaw clears from Stewart. 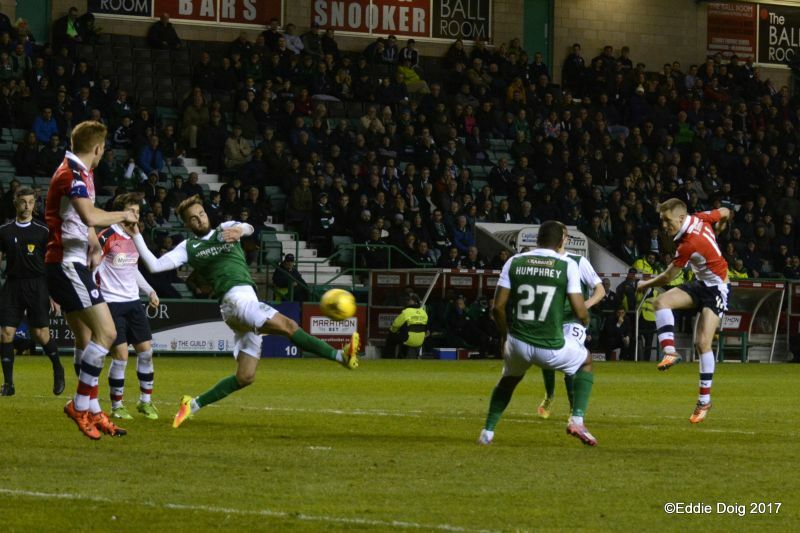 Andrew Shinnie fires the ball over the bar with a shot from 25 yards. 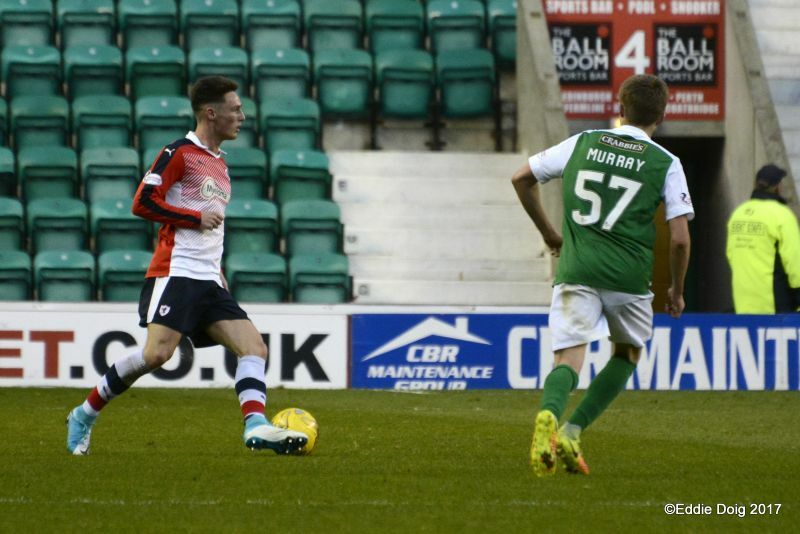 Fraser Murray watched his dipping shot go narrowly over the bar from 25 yards. B Barr withe the first meaningful cross of the half sees the ball fall to Laidlaw. 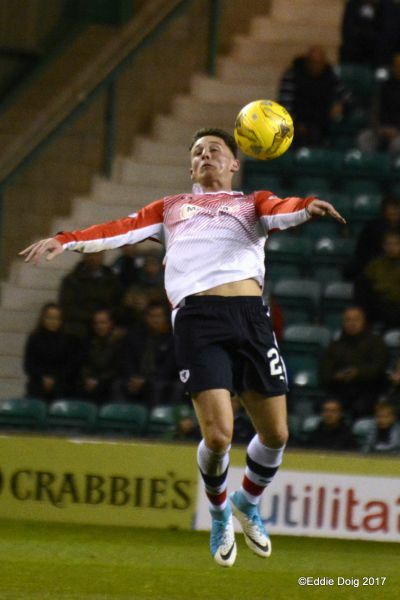 Keatings yellow for a foul on Stewart. B Barr playing on Johnston who shoots low ftom the edge of the area, Laidlaw collects. Johnston hits a squiggler straight to Laidlaw from outside the area. 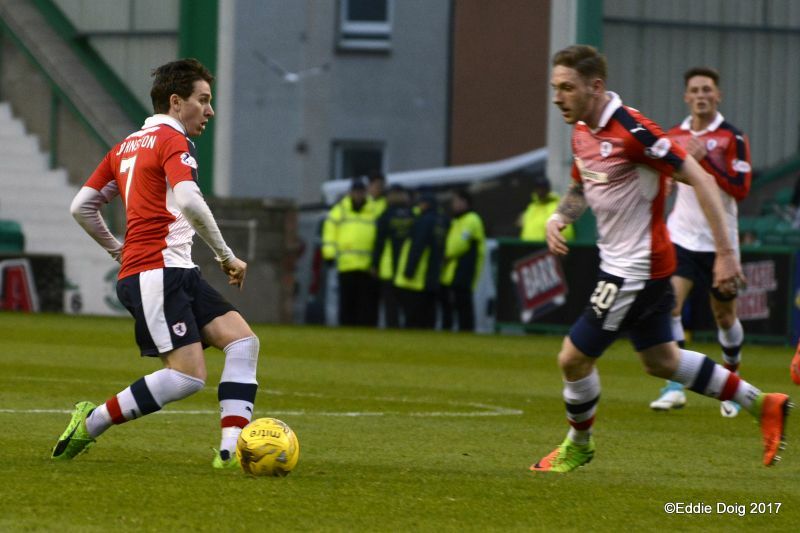 From a corner Thomson flicks the ball to McManus who shoots high across the face of goal. 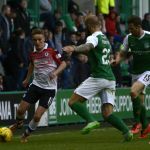 Goal Hibernian, Humphrey with a cross from the right found Keatings at the back post and he slotted the ball into the net. Fraser Murray going down in the box, shouts for a penalty but is flagged offside. 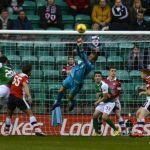 Nearly an OG as Harris cleared just over the bar. Harris with a cross, the ball hits Murray and just out for a goal kick. 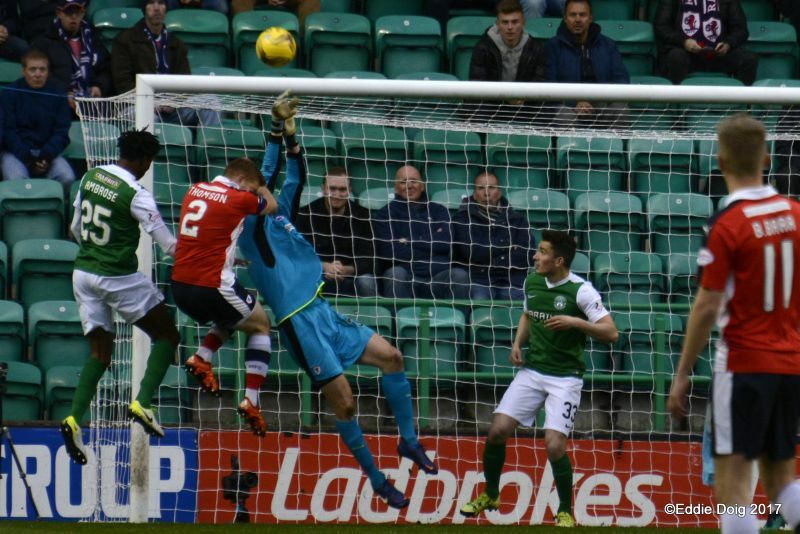 McManus has the ball in the net but Mr Aitken whistles for a foul. 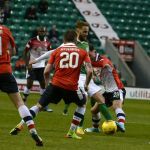 Shinnie bundled M'Voto to the deck, Big Jock gets up and limps on. 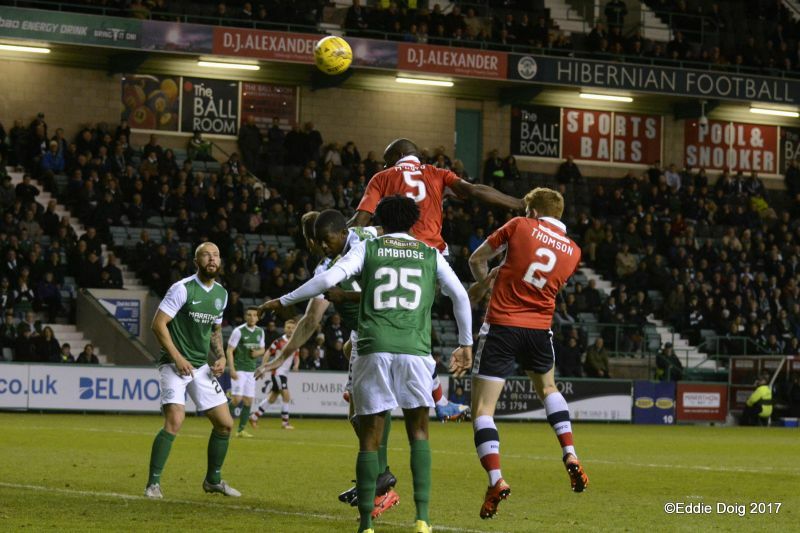 Shinnie bicycle kicks the ball into the Famous Five Stand. B Barr shoots and the ball hits Ambrose square in the gub and then cleared. Bobby Barr found McManus clear on the left and he rocketed the ball past Laidlaw from 10 yards. 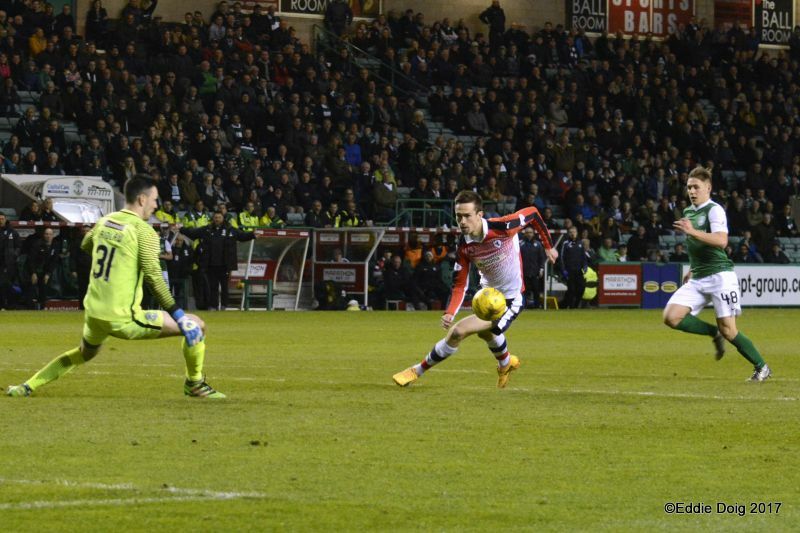 Shinnie heads past at the back post from the free kick. McManus chips Laidlaw and the ball comes back off the post. 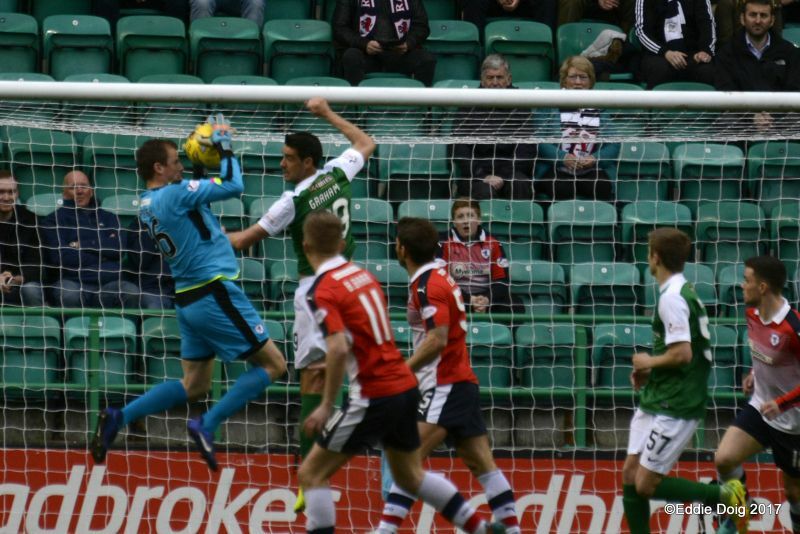 An old fashioned stramash in the Rovers box sees Penksa eventually fall on the ball. Ambrose yellow for a foul. McManus with an overhead kick outside the area forcing Laidlaw to tip the ball over the bar. Court yellow for a foul on Bartley. 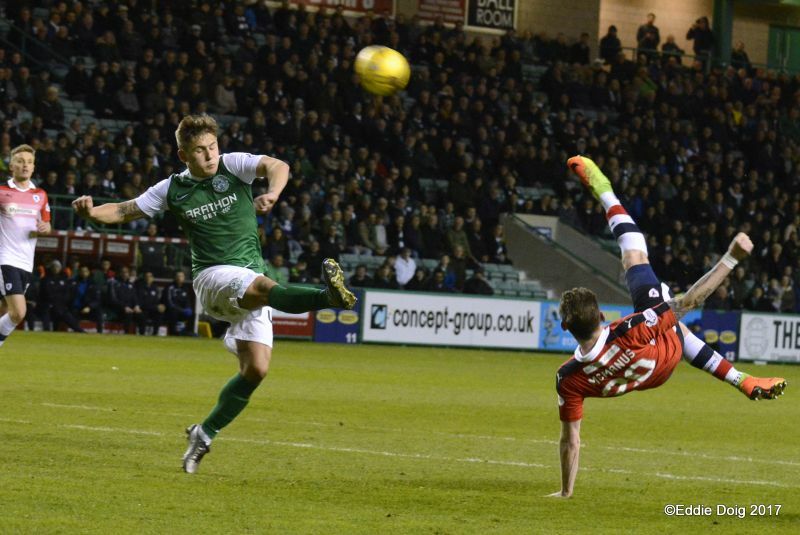 Goal Hibernian, Holt picked off a wayward backpass and shot past Penksa. 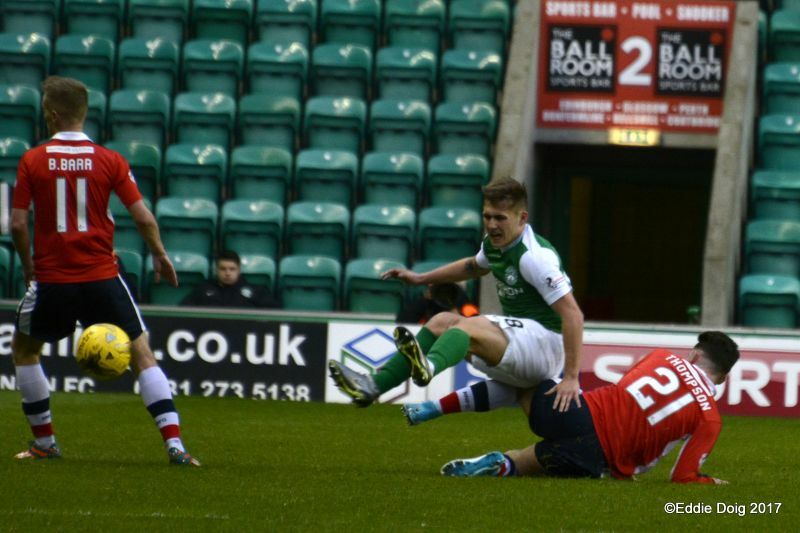 Court found Hardie who beat the offside trap, Hardie rounded Laidlaw and slotted home from a tight angle. Fraser Murray off, Sean Mackie on. +1 Thompson yellow for hand ball. 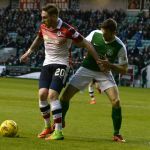 +2 Goal Hibernian, Keatings direct from the free kick. 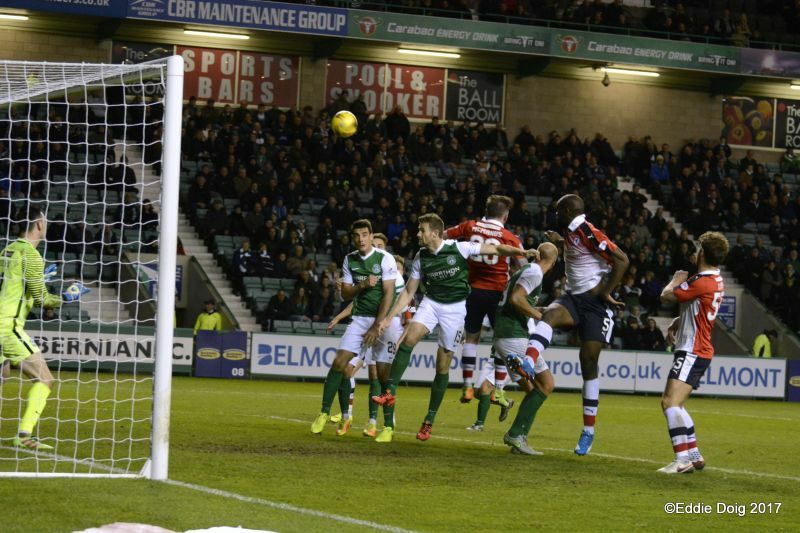 Laidlaw, McLean, Keatings, Shinnie, Forster, Ambrose, Humphrey, Graham, Harris, Martin, F Murray. Subs, Dabrowski, Bartley, Holt, I Murray, Waugh, Donaldson, Mackie. Penksa, Thomson, McHattie, M'Voto, Johnston, Stewart, B Barr, Matthews, McManus, Thompson, C Barr. Subs, Brennan, Benedictus, Roberts, Court, Hardie. 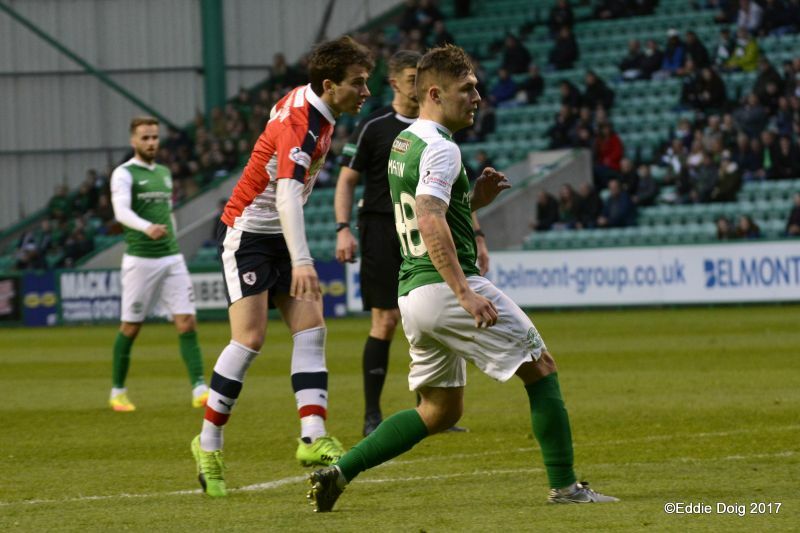 After a weekend of inactivity, Raith Rovers are back in action on Wednesday evening, when they travel to Easter Road to face league champions, Hibernian. 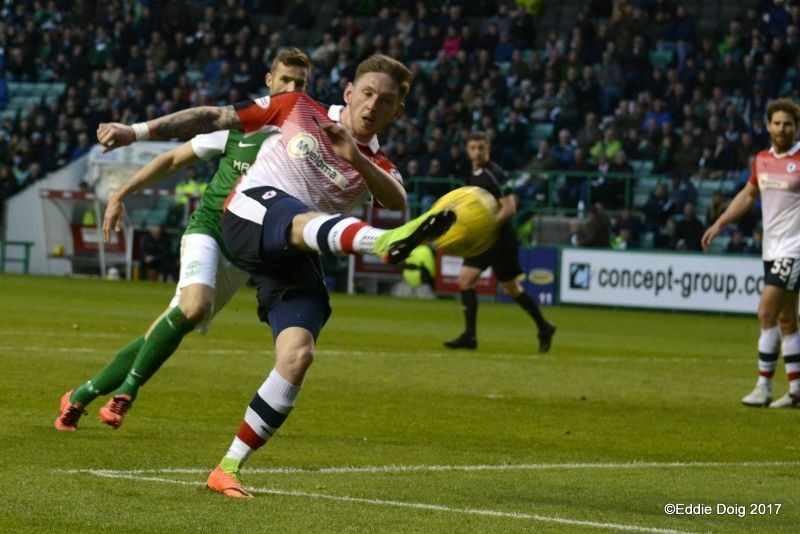 Raith’s enforced layoff was caused by Hibs taking part in the Scottish Cup semi-finals, and they were close to making it to their second successive final, only to be cruelly denied by Jonny Hayes late deflected strike. 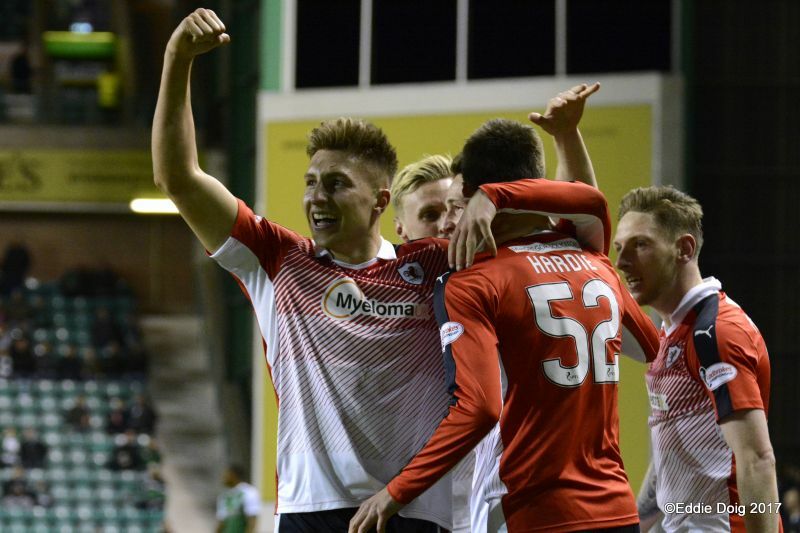 In terms of other results, it was a mixed bag for John Hughes side, with Dumbarton’s win seeing them move back up to seventh, while Ayr closed the gap to three points, with a point at Morton. However, St. Mirren’s last minute loss to Dundee United, means Raith can move four clear of the Buddies and six ahead of Ayr with a victory in this one. It’ll be the fourth time the two sides have met this term, and to date, the fixtures have yet to produce a winner. 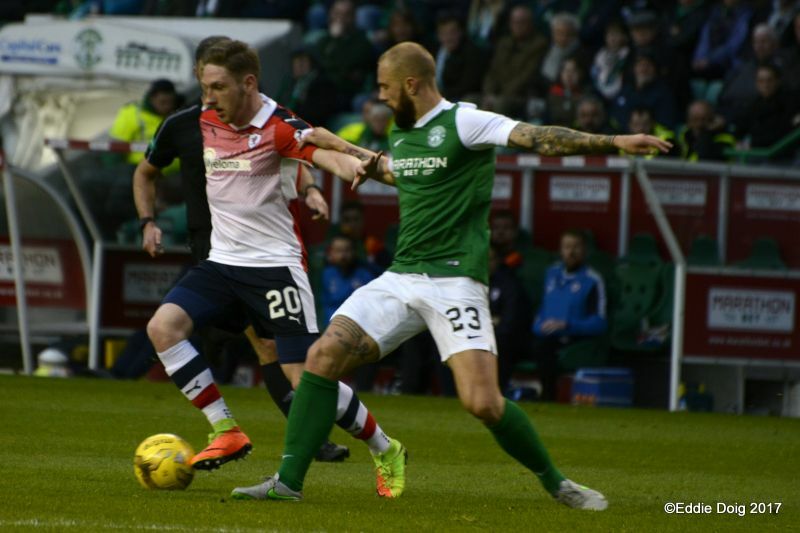 A 0-0 draw was played out at Stark’s Park back in October, while the two sides drew one apiece when they met at Easter Road on Christmas Eve. 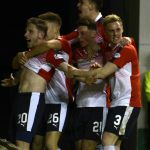 Jean Yves-M’Voto headed Rovers in front early in the second-half, and Rovers were moments away from a notable victory, before Martin Boyle equalised for the hosts with two minutes remaining. 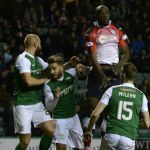 It was the same scoreline the last time the two sides met in February, when Raith again took the lead via a Ryan Stevenson thunderbolt, before another exquisite goal from Jason Cummings, again meant the sides shared the spoils. 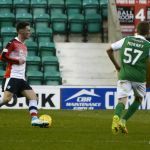 If Rovers can avoid defeat on Wednesday night, then it’ll be the first time they’ve went unbeaten against Hibs for an entire league season since the 1995/96 campaign. 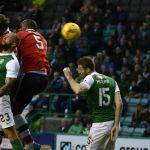 Raith are currently unbeaten in four consecutive league matches against Hibs, and have won two and drawn four of the last ten league meetings. Wednesday evening’s match referee will be Greg Aitken.